Five steam engines (Consolidation 2-8-0; N&W J 4-8-4; NYC Niagra 4-8-4; Santa Fe Northern 4-8-4; and GS4 4-8-4) were originally listed in '92 as new Bachmann Plus releases. All had previously been part of the company's line. The diesel Bachmann Plus releases featured new tooling pieces and included: F7-A and F7-B, B23-7, GP35, SD45, and B30-7 diesels. The 1992 Plus line introduction featured the F7A and F7B, plus the B23-7. The GP35 arrives in 1993; the SD45 shows first in 1994; and 1996 had the B30-7. The B23-7 and B30-7 are identical models both drive and shell tooling. The Plus line comes in four years after Bachmann had introduced its upscale Spectrum series in 1988. The Plus diesels shared features found on Spectrum diesels. For example, the Spectrum GP30 drive and separately applied factory installed grab irons and coupler lift bars are also characteristics of the Plus line GP35. The drive included an all metal chassis, helical cut gears, 8-wheel drive, 5-pole skew wound motors, and dual machined and balanced brass flywheels. Multiple roadnumbers per roadname were also a feature found in the Plus series. Perhaps their similarity with the Spectrum line was a factor in the short life of the Plus line. By the late '90s, the Spectrum line would include all the previously issued Plus diesels minus the F7A and F7B. 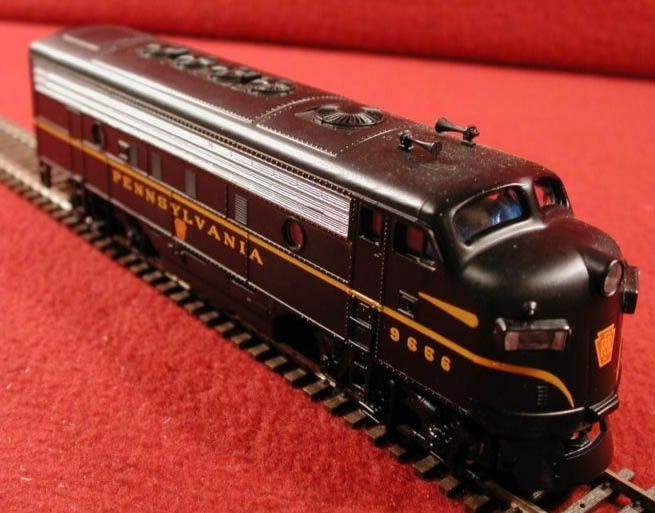 Though the Plus diesel were improvements over the standard Bachmann diesels of the early '90s, all the pieces have various flaws and distractions that serious model railroaders would take issue. The F7A has a very unappealing front pilot. The design of the pilot places it a bit too high on the unit's frame. This makes the pilot's clearance area too large and give the model an odd sits too high over the rails look. The B23-7 and B30-7 shells are generally fine in appearance, the major drawback to this models look are the very thick oversized handrails. The big handrails seem an odd mistake, as Bachmann had demonstrated nicely proportioned examples on the GP30, GP50, and SD40-2 in their regular line. Given the longevity the B23/30-7 has enjoyed with Bachmann, it is a shame thinner handrails have never been provided to this loco. Another feature of the GE boat that is a bit distracting is the inclusion of an open cab window on the fireman's side. While an interesting attempt, it tends to make the cab look like it's missing something. The Plus GP35 is close to EMD's GP35 Phase Ia bodystyle. The biggest spotting flaw that makes it not fit the description of a Phase Ia example is the Bachmann Plus model's door latches down the long hood below the dynamic brake blister. My count is six door latches on the Bachmann Plus GP35, which does not match any EMD prototype. There is also an odd appearance to the long hood with respect to the doors and/or the height of the long hood. The space between the top of the doors and the lower edge of the dynamic brake blister appears too large. The cab windows on the Plus GP35 also look a bit tall and narrow. The final new tooling diesel for the HO-scale Bachmann Plus line was the SD45. It shared similar traits with the GP35's appearance, making it good but a bit weak in various areas. The SD45 below the frameline had its weakest points with very plain looking C-trucks and almost no detail to the fuel tank area. Bachmann would later correct these weak spots and improve the shell greatly in later Spectrum releases of the SD45. Outside of HO-scale, Bachmann used the Plus name for its Large Scale line. The 1992 Plus introduction includes three 4-6-0 10-Wheelers in the Big Hauler Large Scale category. The Plus line moves into N-scale in 1994 with an F7A and F7B offering. The previously available N-scale DD40AX Centennial moves to a Plus release in 1995 for N-scale. 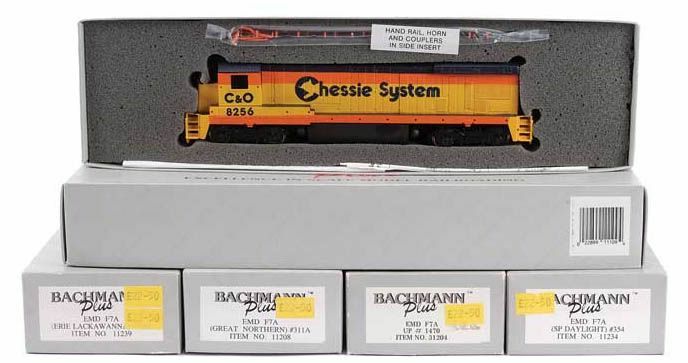 Beyond locomotives, Bachmann put the Plus name on a series of building kits in HO- and N-scale. As with other Plus releases, they survive beyond the Bachmann Plus name, which appears to be dropped in 1997.